Covered in plants from the floor to the ceiling, Ver's is literally a cafe in a green house. Because it's lively decor is so easy on the eyes, this cozy little cafe is very popular. I came here two different times before being able to find a seat, but it was well worth the wait. Grab a coffee, one of their signature flower drinks or desserts, OR a glass of wine. 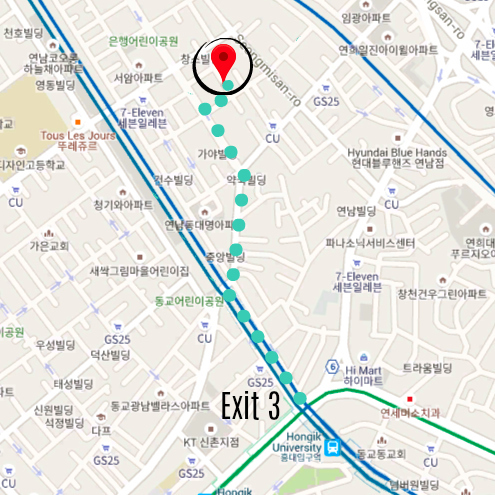 Ver's is located near Hongik University Station on the green (2) line. Walk out of exit 3 through the park and turn right down Donggyo-ro (a main road - and the 5th road on your right). Continue walking straight through the intersection on Donggyo-ro 41-gil and then turn down the first road on your right. Then turn left on Donggyo-ro 45-gil. Open Tuesday through Sunday from 11 a.m. to 9 p.m.
Ver's is closed on Monday.